I bet you are in the process of making your home MERRY AND BRIGHT! Decking the halls and doing Fa-la-la-la-la fun things this Christmas! I am doing that right now too! 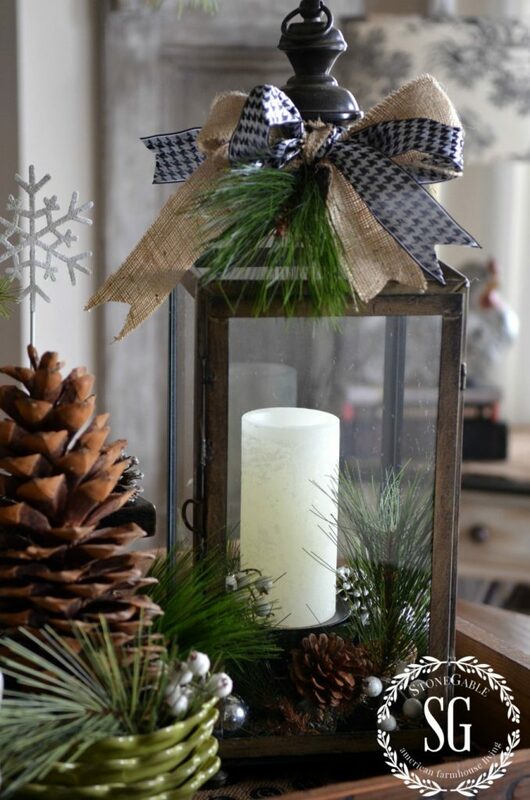 One great way to give your home a festive holiday look is by creating Christmas vignettes. I’m so thrilled to be a part of Diane’s CREATING CHRISTMAS MEMORIES WITH VIGNETTES. And I am soooo happy to be here at AN EXTRAORDINARY DAY today!!!! A big thanks to Diane for letting me visit her beautiful blog and be part of this wonderful series! 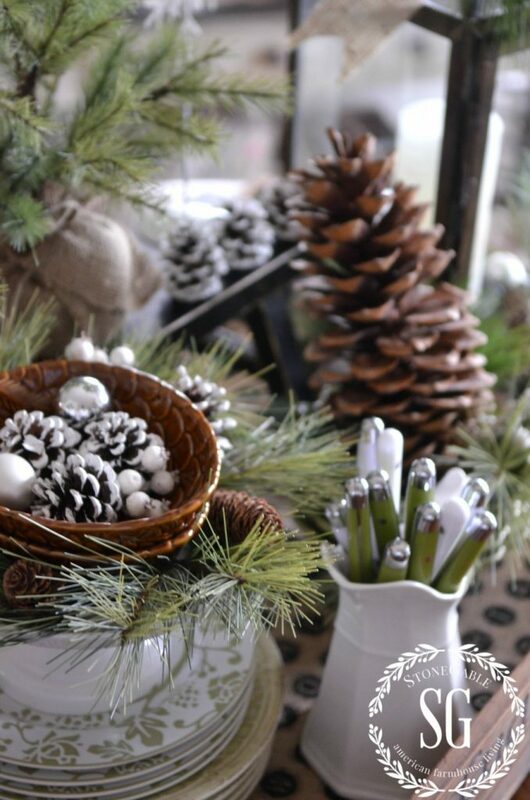 My favorite vignettes to create any time of year are ones on my kitchen table. 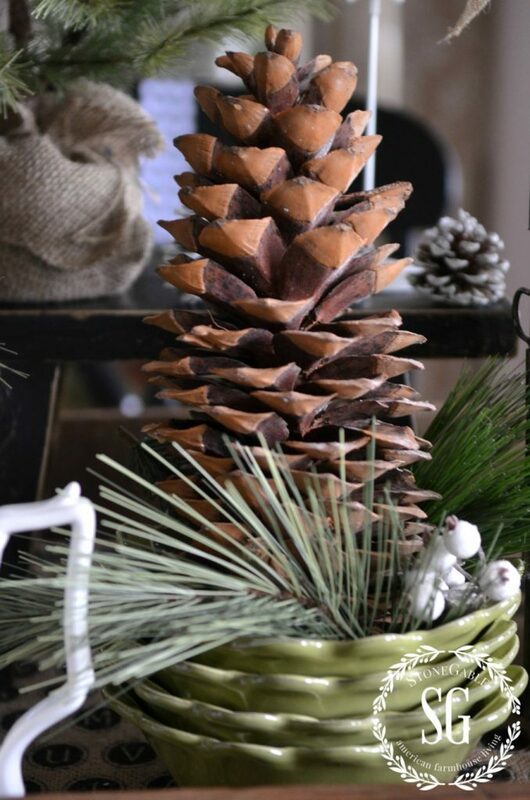 This Christmas I am decorating in naturals, long pines, pinecones and berries. Mostly neutrals, whites, blacks and greens. Sigh! My favorite color combo! This vignette sings Christmas to me. Like a quiet walk in the woods in winter. I adore winterscapes, and winter woods and all things winter. I think winter is an under loved season! And this time of the year a vignette like this one reminds me of the song, Silent Night… my favorite Christmas carol. It’s a song about early, early Christmas morning and the announcement by the angels of the Christ Child’s birth. The wee hours of Christmas are my very favorite. It just feels holy! Did you know that Silent Night was written as a poem first? Its origin is from the Austrian Alps in 1818. One Christmas when the Church organ was broken, a pastor put his poem to guitar music and the most beloved Christmas carol was born. You can read the whole story HERE. In the spirit of an “all is calm, all is bright spirit”, I’ll show you how I put this vignette together! I corral my vignette items in a basket, tray or this big wooden packing crate. I think the wooden crate looks best on my barn beam table. I covered the bottom of the box with a printed burlap. It make the perfect container for vignettes! 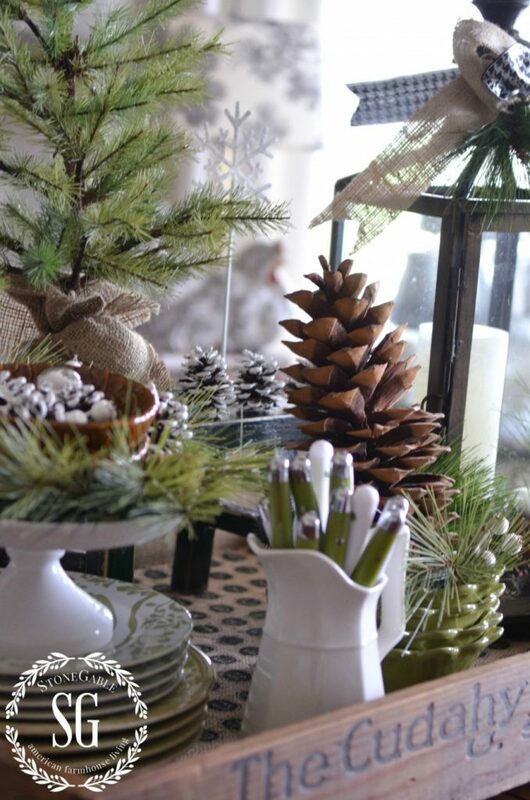 In the crate I stacked green and white dishes, a white pedestal and some cute pinecone plates circled with greens! I love love love stacking dishes, especially in a kitchen vignette! I say, “Get those dishes out of the cupboards and use them to decorate!”. 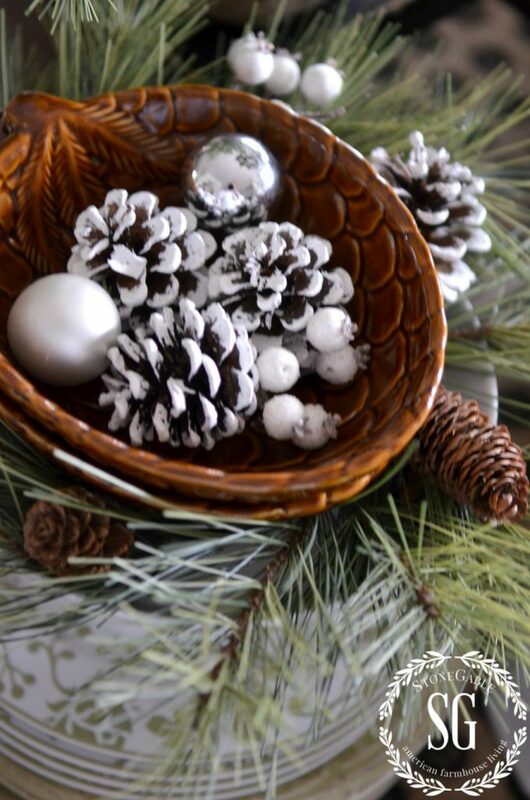 And I like to put a touch of the season in bowls… unexpected and fun! More bowls and a big sugar pinecone! 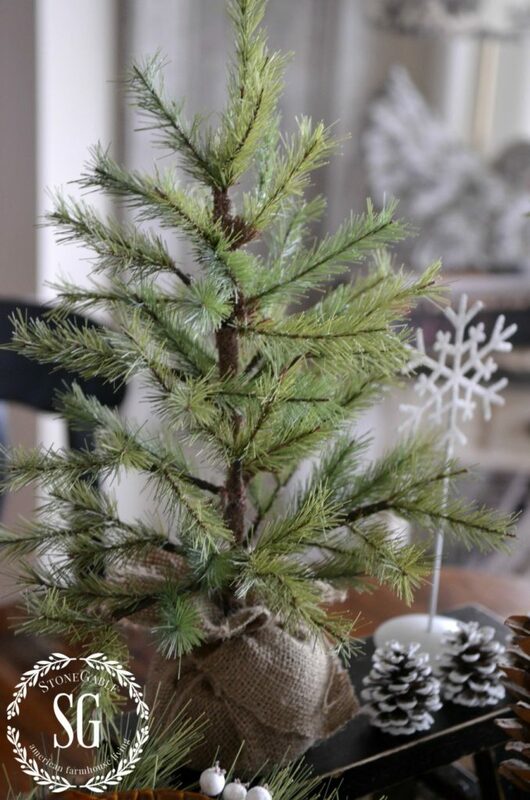 Speaking of a touch of the season… I put a little pine tree on a chippy black bench. Using benches, risers and pedestal dishes varies heights in your vignettes and adds lots of interest. Another must in a kitchen table vignette is a lantern or candle. There is something so romantic about lighting a candle at dinnertime! 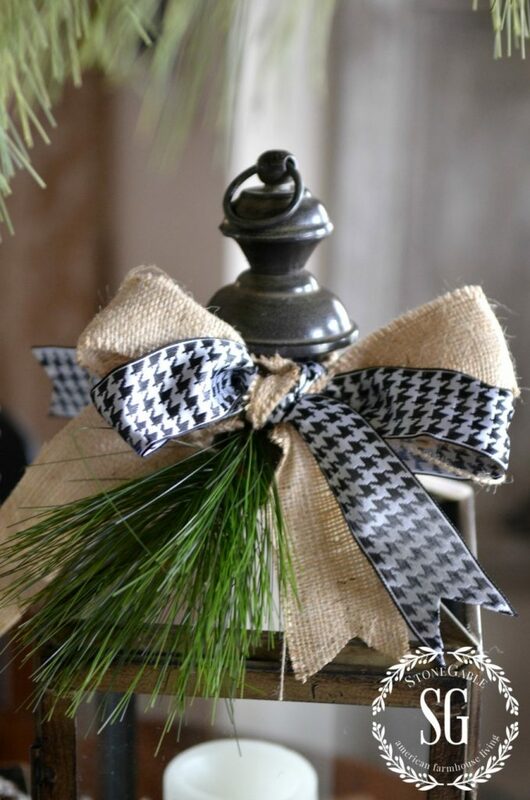 I added greens and a big burlap and black and white houndstooth bow to the top of the lantern. If you like my Farmhouse Kitchen Vignette you might like to see the rest of my kitchen. 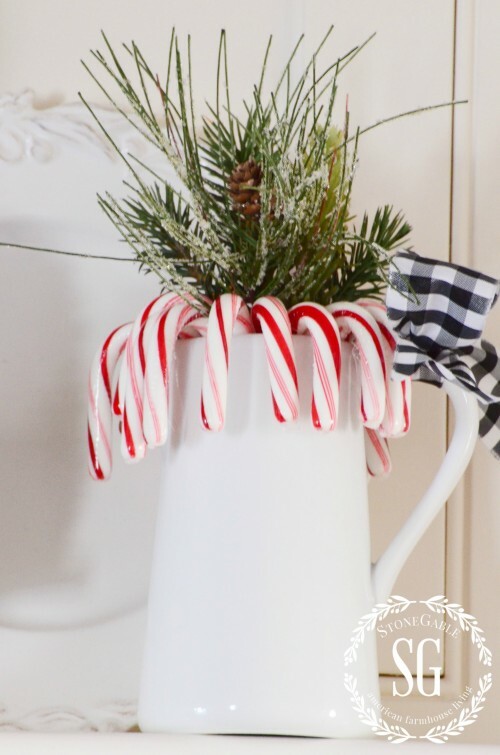 Click HERE to see my Farmhouse Christmas Kitchen. 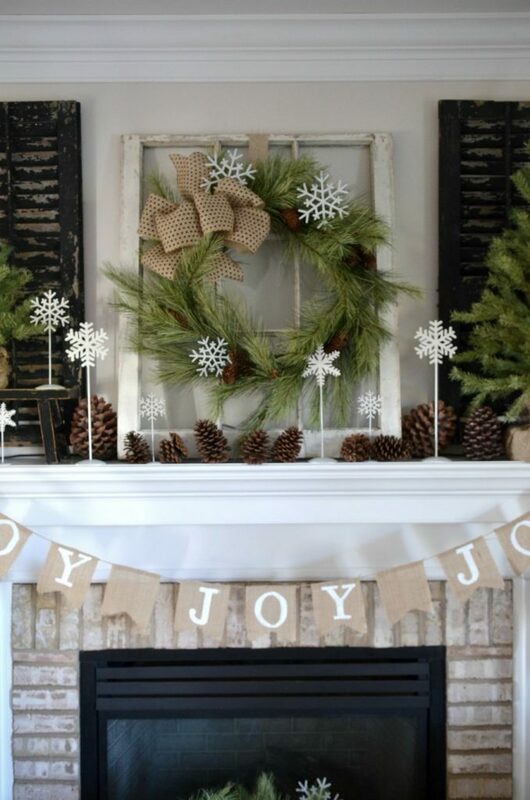 Or how about a FARMHOUSE CHRISTMAS MANTEL? Click HERE. And here are 6 CREATIVE WAYS TO USE CHRISTMAS GREENS. Click HERE. I hope my easy-to-make vignette has inspired you and brought a little Christmas cheer to your day! THANKS SO MUCH, Diane for including me in your series!!! May you feel the awe of Christmas and celebrate the birth of Jesus this year! 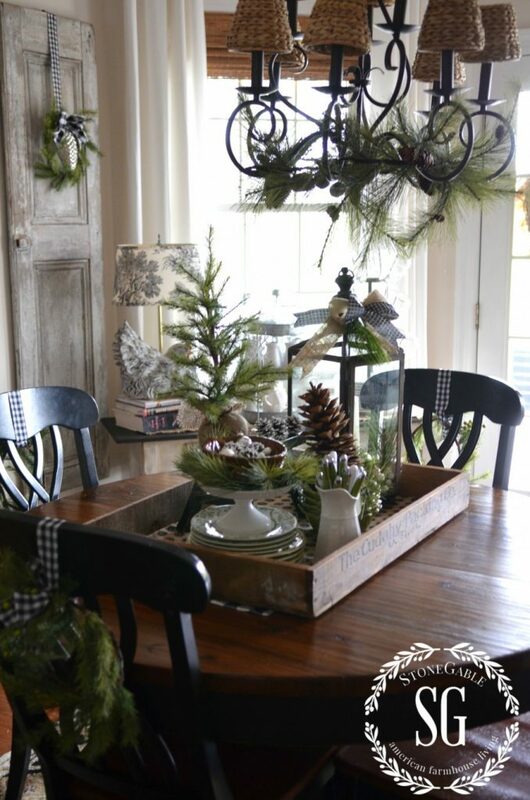 Isn’t Yvonne’s Farmhouse Christmas Vignette gorgeous? Thank you Yvonne for inspiring us on so many levels. I love everything about this vignette and as always your photography captures a mood that I want to evoke in my home, as well. One of calm and peace, filled with rich meaning. I’ve been reading Yvonne’s blog, Stone Gable for a long time. She is an amazing woman of incredible creativity and amazing homemaking skills. I appreciate her genuine warmth and how she gently infuses her faith in her writing. I’ve told Yvonne, that I think she is the queen of vignettes. Many times, I’ve shown her blog to friends for creating those beautiful decorative moments we all love to have in our homes. This is the sixth in our series, Creating Christmas Memories with Vignettes. If you missed it, the series began here. I want to remind you that the beauty of decorating with vignettes, is that you can place as many or as few as you like in your home. It will reduce your stress because wherever you complete a Christmas memory vignette your decorating is done until you have the time or desire to create another. If you’re time-starved this method of decorating is very freeing. If you enjoyed this post… please pass it on to your friends. Best wishes for an Extraordinary season of Christmas! Thank YOU, Yvonne for blessing me. It’s the loveliest of Christmas gifts! I love all the natural elements in this, and the black and white touches. So pretty! I agree Nicki! Yvonne really has the knack for combining colors, tones, and textures that are gorgeous! Thanks for popping by! Hope your weekend is extraordinary! Jeannie you are so sweet to stop by and to leave your kind words. Gorgeous! I loved ever single photo! Thanks Jill! I feel so bless to have Yvonne sharing with us. All the best for a most Merry and Blessed Christmas! Amazing! What a warm atmosphere she created with those huge, little touches. This is wonderful. I would love it if you would share this at my party on Welcome to the Woods Wednesday. It will be up a going on Tuesday evening. Hope to see you there. And that makes YOU extraordinary Shelley!! Thank you so much for stopping by and for your kind words! Very pretty natural elements decorating! I collect many pine cones along my walks in my neighborhood and I saw amny ideas in your post I’d like to replicate. Thanks so much for the inspiration! Yvonne makes magic with everything she touches! She sure does!! That girl has so much talent and a heart that matches!!! Thanks for popping by Jenna! Love Yvonne’s décor! 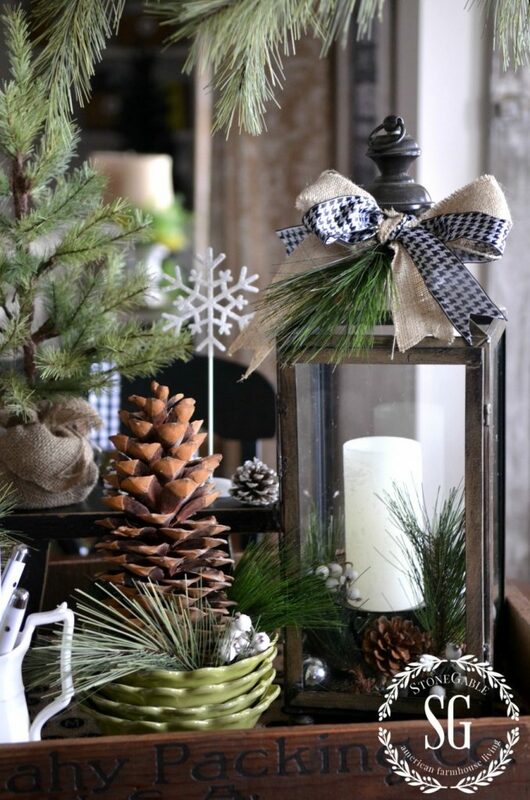 It’s all so pretty… love all the touches of evergreen here and there! Thanks SO much for linking up at Your Turn To Shine. Hope to see you back, friend! Thanks Kendra! I’m so glad you enjoyed Yvonne’s vignettes. All the best for a JOYful Christmas! Love everything! The natural elements and the gingham ribbon are my favs!! Thanks for sharing at Fridays Unfolded! Thanks so much Denise!! Yvonne is always so inspiring with her farmhouse style decor. All the best for an extraordinary Christmas! I been reading and checking your blog thru Yvonne and this time, I couldn’t keep quiet coz I really adore your vignette. I might do a copycat next Yuletide. Awww… you are sooo sweet! Thank you for your kind words! Yvonne’s displays always make me envious. Everything looks beautiful here. I’ve chosen to include this as part of my features tomorrow at our Your Turn to Shine link party. Thanks for sharing it with us! Merry Christmas, Diane! Thank you for sharing your beautiful decor on The HomeAcre Hop! I’m featuring your post today 🙂 Can’t wait to see what you share this week! 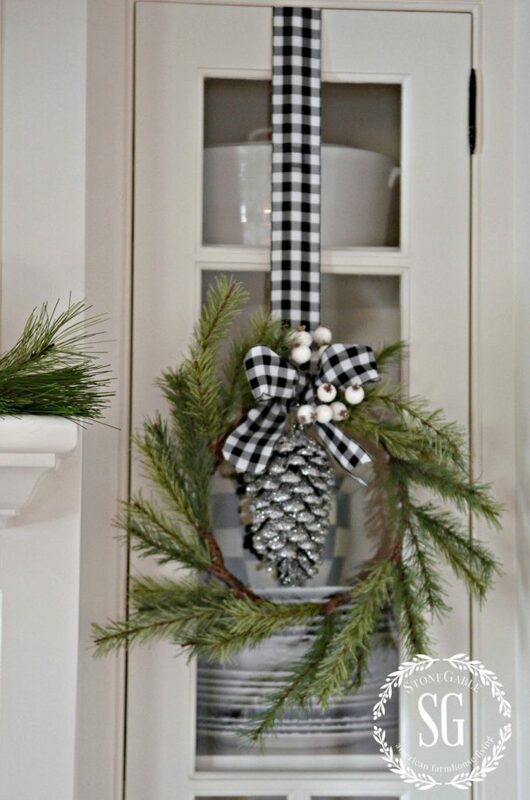 I love the woodland, simple Christmas decor that seems to be all over blogland this Christmas. The tray with all our goodies, pinecones, snowflakes, and the great black lantern is so country! I love it! Where did you find those adorable pinecone dishes? I am off to visit your kitchen and add you to my followers list! Life is good in the country!! One more question,,,how did you create the label you have on your pictures…I like it!! very nice touch. I use Picmonkey for editing photos. Thanks for the info. Yvonne does create the most beautiful vignettes!! Just lovely! Thank you for joining HSH! Have a very Merry Christmas! Your vignette is beautiful. You have what looks like bamboo sticks with silver tops in a white picture. What are those green & white bamboo looking things? I feel silly asking but I really can’t tell what those are!! Thank you for your inspiration & about the story of how the song “Silent Night” was written. Thanks so much for your kind words! Merry Christmas Cindy!